The new Tax Cuts and Jobs Act of 2017 has many new implications for small businesses. We sat down with PIDC’s legal team to learn more about a unique change to the tax treatment of pass-through entities and circumstances that may cause a business owner to switch from partnership to s-corporation designation. The limited liability and pass-through tax treatment of limited liability companies (LLCs) has made it a VERY popular legal entity structure over the past few decades. As an owner of an LLC, you selected (or will select) how your business is treated by the Internal Revenue Service (IRS) for tax purposes. Changes implemented by The Tax Cuts and Jobs Act of 2017 (TCJA) have some small business owners re-evaluating their tax designation as a partnership and maybe you should too. While it is best to consult a tax professional (such as an accountant or tax lawyer) before making a decision, you may want to consider how the IRS treats business income from partnerships versus s-corporations before inquiring further. (3) must exclusively have shareholders that are not legal entities (thus an LLC with an LLC or limited partnership member may not be eligible for s-corporation designation). Prior to TCJA, an owner of a pass-through entity was taxed on the business’ profits at his or her individual tax rate. The TCJA, however, introduced a 20% deduction of qualified business income (QBI) for pass-through entities. Although the QBI deduction is set to expire after the 2025 tax year, taking advantage of this designation may offer great benefits in the interim and the QBI deduction could possibly be extended beyond 2025. Before an owner can determine whether s-corporation or partnership designation is beneficial, it should understand QBI. Simply stated, QBI is the net amount of income, gain, deduction, and loss incurred by a business. QBI does not include investment-related income or loss, such as income from capital gains, dividend income, or interest income. • The sum of 25% of the W-2 wages plus 2.5% of the unadjusted basis immediately after acquisition of all qualified property (tangible property subject to depreciation). For business owners claiming taxable income between $157,500 or $207,000 (or between $315,000 and $415,000), the W-2 and capital limitations apply in proportion to the amount that the taxpayer’s income exceeds the lower threshold amount. After calculating QBI and before calculating the QBI deduction, owners of s-corporations that are either an employee of the business or provide valuable services to the business must deduct “reasonable compensation” from its share of business income. IRS guidelines suggest that owners consider factors such as the business location, training and experience of the owner, the owner’s duties and responsibilities, comparable salaries of non-shareholder employees and comparable salaries of employees of other businesses providing similar services when determining reasonable compensation. Although the reasonable compensation paid to an owner of an s-corporation is subject to the 15.3% self-employment tax that all QBI of partnerships and sole proprietorships are subject to, the remaining QBI of an s-corporation is not subject to the self-employment tax. While owners of partnerships and sole proprietorships can apply the 20% QBI deduction to all QBI, owners of s-corporations may only apply the 20% deduction to the non-compensatory portion of their QBI. 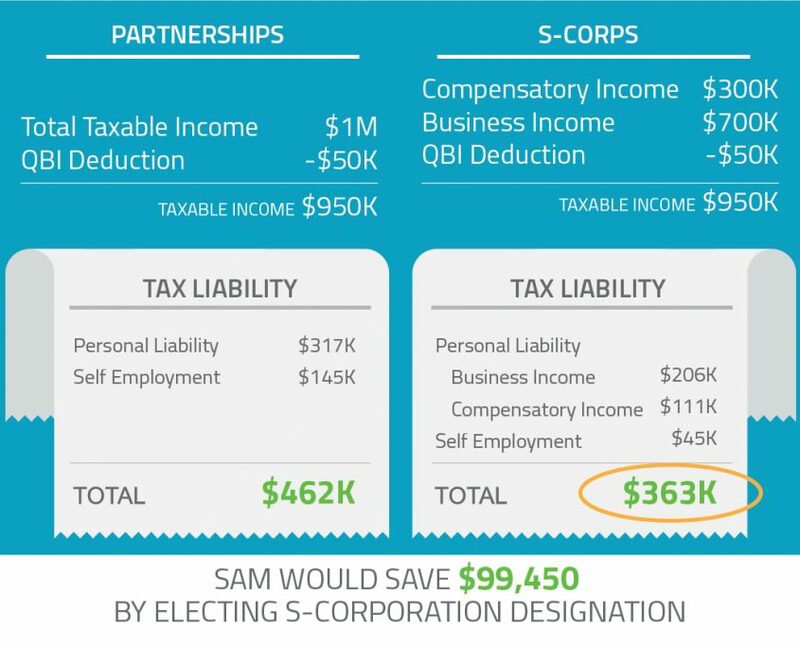 Before electing s-corporation designation, you should determine whether the tax benefit of avoiding self-employment tax on your non-compensatory QBI outweighs the foregone benefit under the QBI deduction. Sam is the sole owner of Dog Groomers, LLC. The total taxable income for the business is $1,000,000, after deductions for reasonable business expenses including $100,000 in W-2 wages to employees and depreciation on the $65,000 worth of equipment Sam purchased for the business. Sam is unmarried, has no other source of income, and is taxed on personal income at a rate of 37% (total liability of $150,689.50 plus 37% of the amount of income over $500,000). His reasonable compensation for services as owner and manager of the business is $300,000. 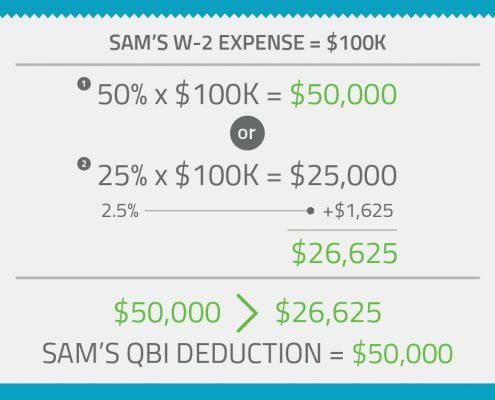 Step 1: What is Sam’s QBI Deduction? Step 2: What tax designation should Sam choose? Prior to passage of the TCJA, s-corporation designation was often beneficial to shareholders whose business income exceeded their reasonable compensation. 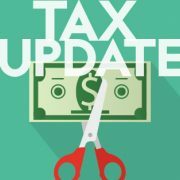 Due to the QBI deduction instituted by the TCJA, s-corporation designation is beneficial for a small business if the money saved by avoiding the self-employment tax on non-compensatory income is greater than any foregone benefit under the QBI deduction. As a business owner, you should consult a tax professional for guidance specific to the circumstances of your business. ** Special thanks to Tarik Brooks and Hope Kildea for contributing this article. *** DISCLAIMER: This Article has been prepared and published for informational purposes only and is not offered, nor should it be construed, as legal or accounting advice on any specific facts or circumstances. The contents of this article are intended for general informational purposes only and you are urged to consult an attorney or other professional concerning any particular situation and any question that you may have. Find out more about small business taxes at the City level through PIDC’s Business Builder Workshop Series.